There is no shortage of competition in the wedding industry, and planners hoping to make a name for themselves need to work extra hard to build their initial client base. Because weddings are a one-off type of event, you must generate new leads on a consistent basis. This is where marketing comes into play, requiring alternative methods to secure new business. You won’t survive if you are going to be just a "wedding planner.” To succeed in any industry, you need to have what is called a Unique Selling Proposition (USP). You could easily spend an entire day researching USP’s, and you probably should, but for the purpose of this article, you simply need to know that being specifically unique is a great thing. There are wedding planners that focus on niche wedding themes, and others who cater only to a specific demographic. A profitable—and exhilirating—niche is planning adventure style weddings, allowing you to get paid while you travel to exotic locales. Really focusing on your target demographic will not only get you more clients, but will create the image that you are somewhat of an expert in your field. An easy way to understand what a prospect might need is to put yourself in the shoes of your potential customers and search through the options yourself. Do you automatically turn to the internet for ideas? If so, what were the first websites that caught your attention? What about family and friends who have hired planners in the past? A simple Facebook post might help you get valuable insights as to why some people chose their planner. You can even go direct, asking friends and family who were recently married exactly why they chose their planner. Paying attention to those details will help you secure clients more effectively. 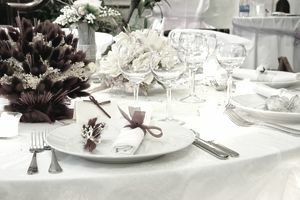 Nothing is more valuable than reaching prospects at the time they are shopping for wedding-related services. Having a trusted vendor hand out your card to their customers is the best advertising you can get. Your target list here should include flower shops, wedding venues, stationery stores and of course, bridal wear outlets. Some of these places will display your material at no charge but if you truly want results, then you should offer some incentives. You can partner with the stores to use their services exclusively, or even add coupon codes to your cards to track response rates and offer referral fees. Like most things money talks, and offering commissions can usually sway someone to your side. The hard part of selling yourself as a wedding planner is that people don’t know what you can bring to the table. One way to prove your expertise is by sharing it through content channels. Become the local expert on wedding planning by writing articles and making appearances on television and radio. These outlets are starving for original content ideas, and if you can pitch a great segment, they will be happy to give you exposure. Just make sure to get your website in place first. Not only is this a professional expectation, but it will provide listeners and viewers with an easy way to find you if they want to learn more. Up-selling is a strategy used by restaurants and retails shops to entice you to spend more. People are easier to sell additional items to when they already have their wallet open. You can play off this as a wedding planner by creating your product line. Websites like Etsy.com make it easy to sell handmade wedding favors, invitations, and table decorations. Of course, this can be a profitable business all by itself, but you can also use it to introduce people to your wedding planning services. Even someone who lives hundreds of miles away might be interested in paying for a phone consultation or customized décor outline. Wedding planners today need to do a lot more than simply open up shop to win clients. But don’t get sucked into spending thousands of dollars on advertising to attract interest. Half the battle is simply distinguishing yourself with a unique service, and then promoting your services in places where potential customers are searching. Best of all, they are less expensive than traditional advertising.